Centmin Mod 1.2.3-eva2000.08+ and higher has added Pure-FTPD virtual FTP user support. 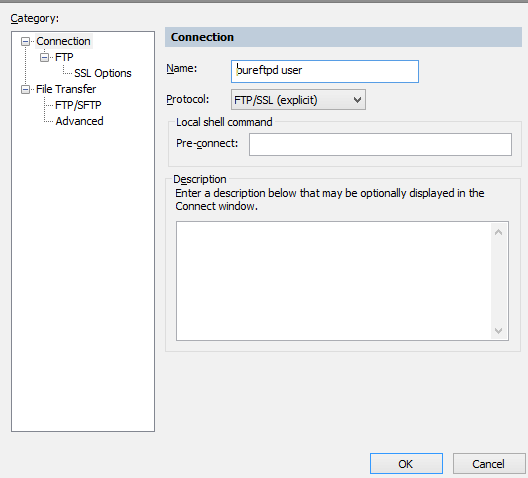 Full example below with both SecureFX and Filezilla FTP/SFTP client configuration examples. 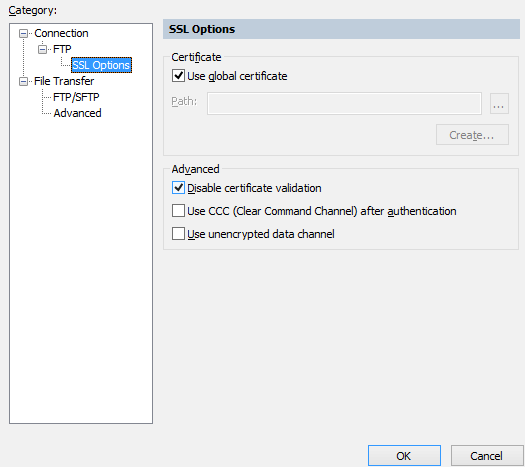 How to Disable Pure-FTPD Forced TLS/SSL Encrypted Mode? 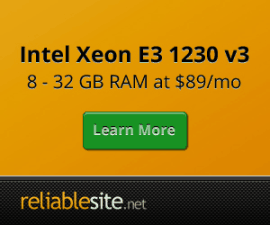 How to re-create Pure-FTPD user for Vhost? 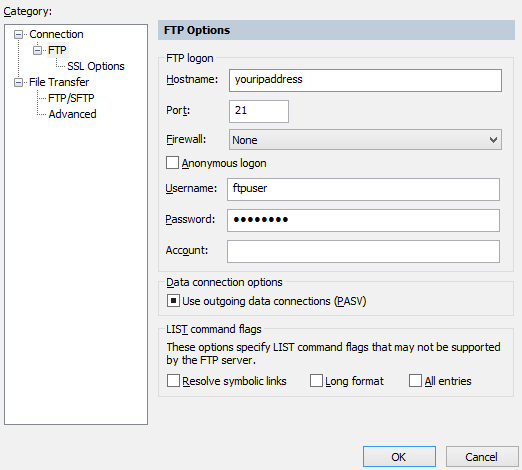 If you're ISP IP address is being blocked when connecting to Pure-FTPD via Pure-FTPD virtual FTP user, check out FAQ item 40. Note passive ports if needed to be set in FTP client are in range between 3000 to 3050 for Centmin Mod 123.08stable or 30001 to 50011 for Centmin Mod 123.09 beta and higher i.e. 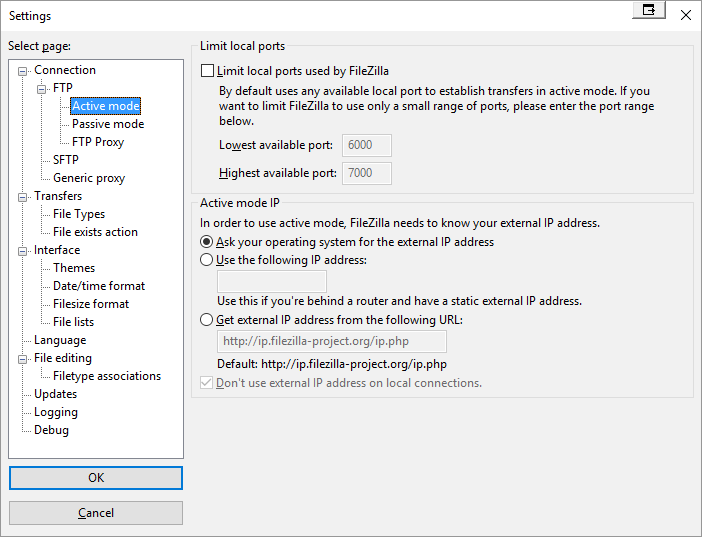 for Filezilla. Upgrades to Centmin Mod 123.09 beta and higher auto reconfigure CSF Firewall to the larger passive TCP ftp passive port range. However, if you are using a web host with their own internal firewall in place, you may need to whitelist these respective passive port ranges for TCP protocol (either 3000 to 3050 or 30001 to 50011). Otherwise, you will not be able to connect to your server via Pure-FTPD details provided by Centmin Mod. 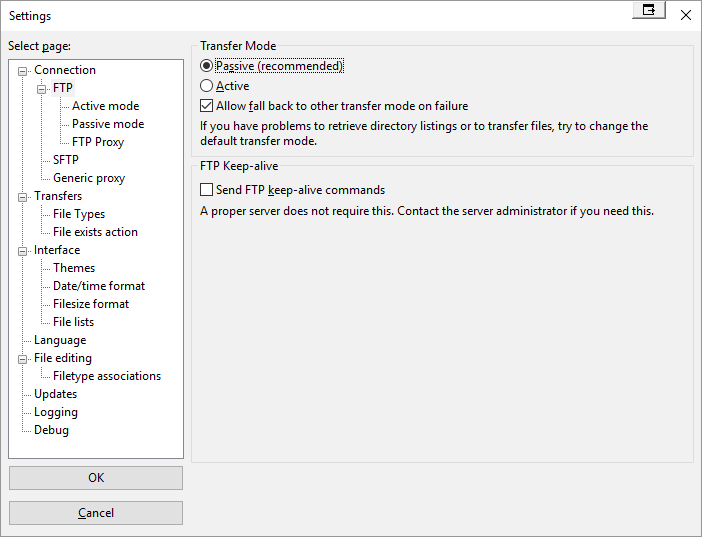 Note passive TCP ports in range between 3000 to 3050 for Centmin Mod 123.08stable or 30001 to 50011 for Centmin Mod 123.09 beta and higher are required to be open for Pure-ftpd server to accept connections. CSF Firewall installed by Centmin Mod takes care of this on server side. 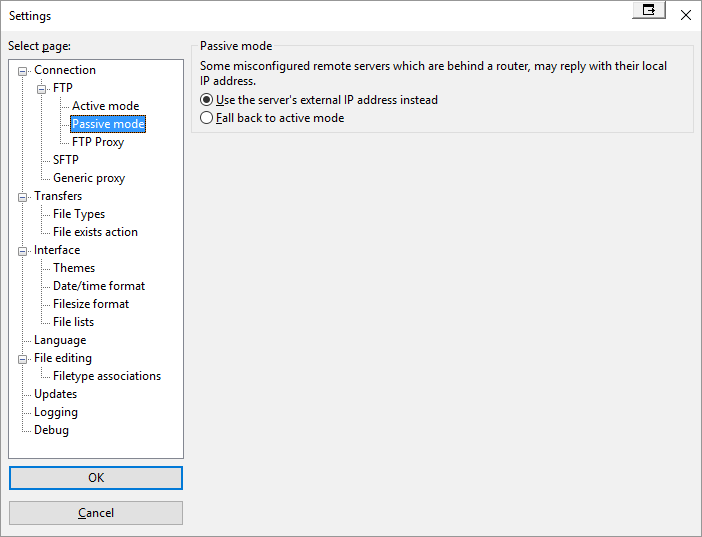 However, if you have other firewalls between your connecting computer and the Centmin Mod server, they may block connections as well. Some web hosts such as Amazon AWS EC2, Google Cloud Compute, Vultr and OVH (OVH Gaming servers) may have their own firewall in front of your server which you can either turn off or configure to whitelist the required TCP ports. 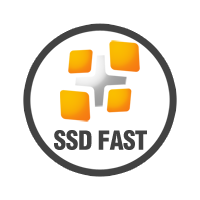 CSF Firewall config file /etc/csf/csf.conf has a list of default ports in comma separated listing that are whitelisted for variables TCP_IN, TCP_OUT, TCP6_IN, TCP6_OUT, UDP_IN, UDP_OUT, UDP6_IN and UDP6_OUT that you can reference. If your local PC or router has restricted ports, you may also need to whitelist them at that level as well. For Vultr Firewall, there is a guide for using Vultr API to replicate CSF Firewall minimum ruleset for inbound access here. On fresh Centmin Mod .08 installs centmin.sh has a new option PUREFTPD_DISABLED=n. Before initial install, change that to PUREFTPD_DISABLED=y to disable pure-ftpd service post initial install. It's still installed but disabled after install and nginx add vhost menu option 2 in centmin.sh automatically detects PUREFTPD_DISABLED=y and doesn't prompt or do any pure-ftpd virtual ftp user routines and skips those for old method prior to pure-ftpd. 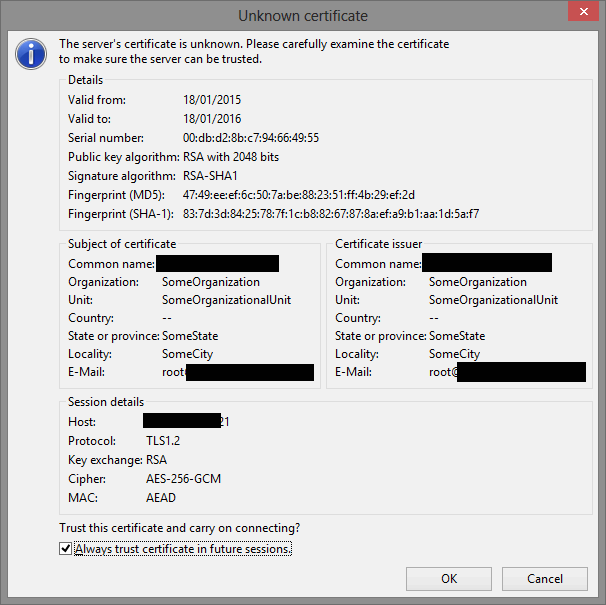 On fresh Centmin Mod .08 installs, Pure-FTPD is configured for encrypted TLS/SSL connections only via self-signed certificate so no plain text connections allowed. However, if you are having issues, you can disable the forced TLS/SSL requirement by editing /etc/pure-ftpd/pure-ftpd.conf config file and changing TLS 2 to TLS 1 - keep the exact spacing format below just in case in future centmin.sh does some auto magic for changes. However, for security reasons I highly recommend you DO NOT disable TLS/SSL encrypted connections!